Currently laparoscopic surgery is getting standard. Many procedures such as cholecystectomy, gastrectomy and colectomy are performed primarily by laparoscopic technique. The main concern about educating young doctors is how to give a well balanced education in both open and laparoscopic surgery. In the era of laparoscopic surgery, surgical residents should learn techniques of both open and laparoscopic surgery simultaneously. We’ll introduce the training system in Kameda Medical Center (KMC). Residency program in KMC contains rotating junior residency and senior residency with smooth translation. Junior residents learn patient management and join operations as second assistants or laparoscopists. After two years of junior residency, we have four years senior residency in case of surgery. The characteristics of surgical residency in KMC are early exposure as a primary surgeon, simultaneous training of open and laparoscopic surgery, and limiting the number of surgical residents to make each resident be able to experience as many cases as possible (elitism). In contrast to the experienced surgeons, young surgeons learn open and laparoscopic surgery in parallel. In some cases such as cholecystectomy, they learn laparoscopic surgery first and then open surgery. They learn in order opposite that of the conventional teaching system. By experiencing laparoscopic surgery, they can learn more detailed operative anatomy and technique through magnified images on monitors. These are helpful for training open surgery too. 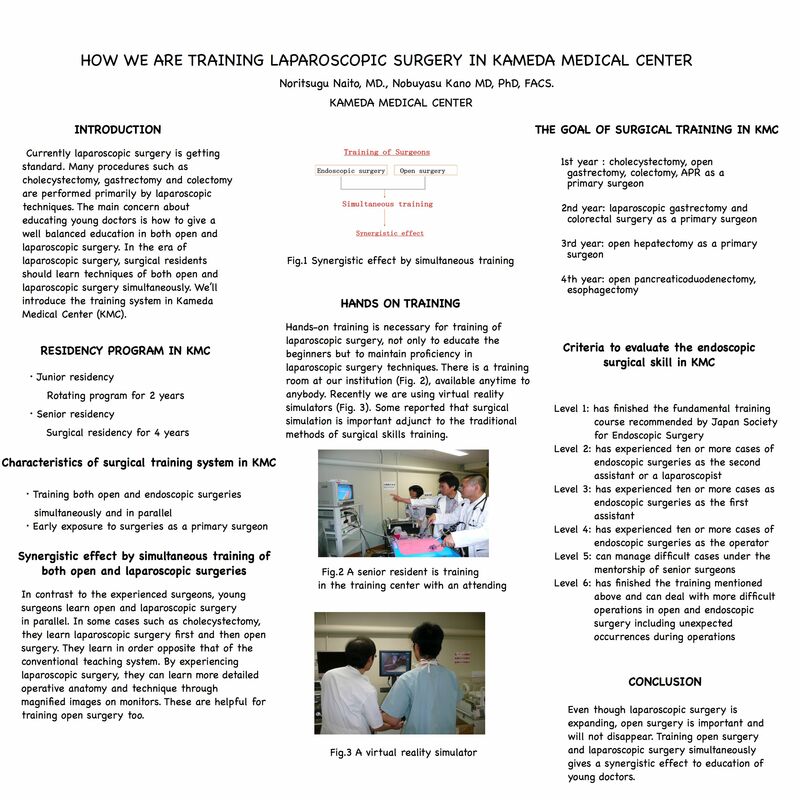 Hands-on training is necessary for training of laparoscopic surgery, not only to educate the beginners but to maintain proficiency in laparoscopic surgery techniques. There is a training room at our institution, available anytime to anybody. Recently we are using virtual reality simulators. Some reported that surgical simulation is important adjunct to the traditional methods of surgical skills training. Even though laparoscopic surgery is expanding, open surgery is important and will not disappear. Training open surgery and laparoscopic surgery simultaneously gives a synergistic effect to education of young doctors.